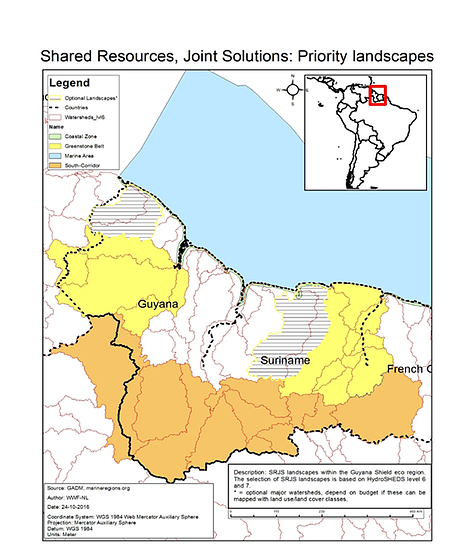 The “Shared Resources, Joint Solutions” (SRJS) program focuses on safeguarding ecosystem-based `International Public Goods` (IPGs, also known as Human Wellbeing Targets) climate resilience, water and food security throughout several countries and landscapes. The intention is to work towards sustainably managed landscapes that provide the most essential ecosystem services on which local communities and the broader economy. The program implementation will occur through a diverse group of partners, primarily Civil Society Organisations (CSOs) and local communities, but also public and private sector stakeholders. Building on a well-thought out Theory of Change, the SRJS program will address priority terrestrial and marine issues, which significantly affect the IPGs at a national and landscape level. The program envisions a robust and empowered civil society in key landscapes that are able to apply knowledge and innovation to ensure their countries meet the collective challenge of sustainable development. Efforts will be focused on four conservation strategies: (1) forests and savannahs, (2) freshwater ecosystems, (3) oceans and environmental governance; which are tightly interwoven with three overarching IPGs: (1) Climate Resilience, (2) Food Security and (3) Freshwater Security. For each of the strategies in the respective landscapes a focused Theory of Change (TOC) has been developed, which elaborates on straightforward and ambitious sub-strategies and projects. The program is funded by the Dutch Government through the Ministry of Foreign Affairs -Netherlands (MFA NL), in collaboration with International Union for Conservation of Nature in the Netherlands (IUCN NL) and World Wide Fund for Nature Netherlands (WWF NL). 3. Coastal Zone and Marine Environment. Preservation or improved climate mitigation and adaptation properties of the landscapes. The partners of the SRJS program are for Suriname, Stg Projekta, ACT, Green Heritage Fund, Kuluwayak, VIDS, Tropenbos, and NCD. It focuses on the specific in-country implementation activities for Suriname and Guyana over the period 2017-2020. While references are made to French Guiana and Brazil for some programmatic activities. The program strategies follow a three-fold, cross-cutting approach towards the targeted goals. First, the SRJS program aims to establish strong and proactive partnerships, which foster cooperation and join forces in the lobby for improving environmental governance and compliance. Secondly, the program wants to ensure that the capacity of local civil society groups and organizations meets their need to lobby and advocate for their interests. Thirdly, the program wants to improve the enabling environment through strengthening targeted policies and practices. In the end, the SRJS program wants to embrace its overall vision by creating added value at the longer term. The sense of co-ownership and co-development emphasize the novelty of the stepwise approach, and encourage partnerships maintenance beyond program borders.